P1: Vovo's greatest experiment came to a tragic conclusion as Woola's mighty paw crushed out the wizard's life. 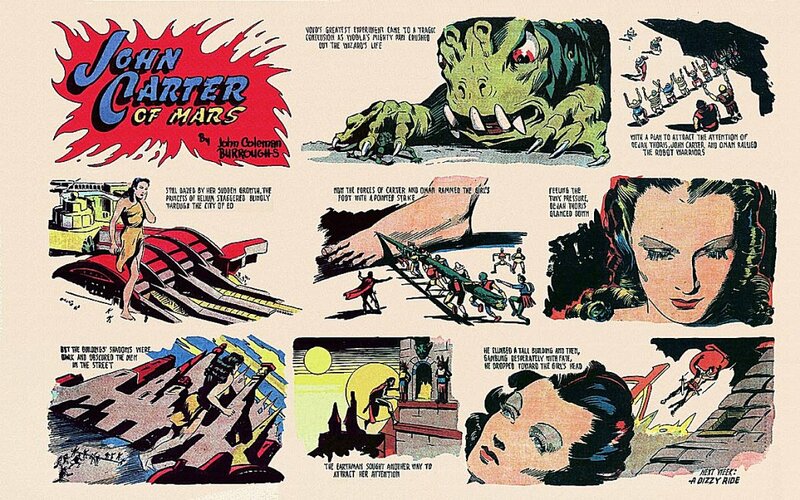 P2: With a plan to attract the attention of Dejah Thoris, John Carter and Oman rallied the robot warriors. P3: Still dazed by her sudden growth, the Princess of Helium staggered blindly through the city of Eo. P4: Now the forces of Carter and Oman rammed the girl's foot with a pointed stake. P5: Feeling the tiny pressure, Dejah Thoris glanced down. P6: But the building's shadows were dark and obscured the men on the street. P7: The Earthman sought another way to attract her attention. P8: He climbed a tall building and then, gambling desperately with fate, he dropped toward the girl's head. 1. Strip #36 provides a resolution to the initial problems presented by the wizard Vovo. He is killed -- by the enlarged Woola, not by Oman, whose mental programming perhaps still hindered him from murdering an intelligent being. And, although Dejah Thoris is fantastically enlarged and very much dazed, at least she is no longer an immobile statue or the captive of a mad scientist. And, as a matter of course, the readers of the Sunday strip soon learn that the enlargement effects will only be temporary. For the first time since the white ape captured the princess, there is a lull in the constant danger and frantic activity. 2. Some thought should be given to the possible psychological for a young woman feeling as though she were a passionless statue, or an unthinking giantess. Or, if that sort of feminine psychology makes no sense, then why she is treated as such, at times, by those around her. What would Freud make of these fantasies, if they were part of a woman's dreams? Also, why might have JCB written such rip-offs from Alice in Wonderland, the Wizard of Oz, and Gulliver's Travels? What common, underlying themes unite these sorts of legendary stories? The narrator of the novelization, Valla Dia, will be largely unaware of Earth's legends and fairytales, although her husband may offer her some small tidbits of knowledege on the subject. Can the narrator imply any meanings for these stange events/fantasies, based upon Barsoomian traditions and customs? Does the experience of Dejah Thoris the giantess, in any way parallel that of Joog the gigantic creation of Pew Mogel (a creature from Barsoom's mythology)? 3. Finally, what might be said about JCB's motivation in writing about John Carter having to try so hard to gain the attention of his dazed and transformed wife? What events were happening in his personal life in 1941-42 that might have influenced him to inject such fanciful themes into his fiction? Mars is not a world where people often reflect upon such subtleties as vindication and irony, but Vovo's defeat came more in Dejah Thoris' plea for restraint than it did in the unrestrained force of Woola's mighty paw. The wizard had expanded the girl's mind in hope of creating an ultimate weapon, never realizing that an expanded consciousness might be accompanied by expanded prudence and compassion. But the green man had no chance to contemplate the justice in his final failure -- the calot's weight crushed out the wizard's life and Barsoom was rid of one of her many dangerous monsters. The speedy Martian dawn broke over Eo, bringing both a new day and a new era for the hermit city. While the tiny beings at her feet were yet hidden in the fading shadows, Dejah Thoris watched the red light appear and intensify across the far horizon. "How beautiful!" she exclaimed. "I'm not sure that I ever before realized just how beautiful our sunrises can be!" But then she again wondered who she was and what concepts like "before" and "our" really meant. Preceding the day there was a night -- a night that just ended. What had happened during that night, her dazed senses could not yet tell her. The gleam of the morning sun upon the rooftops of the city caught her eye and the giantess, accompanied by the huge calot, wandered off to investigate. Of all of Eo's mechanical inhabitants only Oman could feel anxiety. His concern over the great damage the uncontrolled calot might do was only slightly relieved by his witnessing the maiden's good influence with the creature. The robots the animal had so far damaged could be repaired or replaced, but the Odwar of Eo knew that Vovo's evil methods must never be replaced by any similar mind control. As the new leader of the mechano-men he had to insure their safety and protect the city, while avoiding the corrupting influences demonstrated in the rule of the little green tyrant. So it was a different kind of anxiety that Oman ordered two of his most highly advanced robots to repair Vovo's microphone and bring the important device to him in the city with all possible speed. Before sunrise John Carter had tried every method he could think of to gain the attention of Dejah Thoris, but nothing worked. Employing the lifting power of a band of the mechano-men he and Oman had struck the giantess' foot with the trunk of a fallen tree, but she ignored the slight discomfort altogether. Even when the Virginia fighting man leaped as high as he could and shouted with all his strength, the giantess did not hear him. Finally, he had attempted mental contact, but the results were not very useful. He could perceive some of her confused thoughts but, so far, the giantess had not responded with any telepathy of her own. As for Woola, the sight of Vovo's crushed body told the Earthman that it might be best to avoid the angry calot's notice until the could be properly restrained. Captain Carter could see both giants crashing through the jungle in the direction of the little city, but, as the height of the princess was a little lower than that of the taller trees, he soon lost sight of Dejah Thoris. The two huge bodies made such a wide trail through the dense vegetation however, that it was not difficult to follow their path. Here and there the large footprints had broken through the topsoil, exposing broken ceilings trampled rooms and in Eo's cavernous complex of underground factories and storage rooms. "Oman!" he called to the leader of the robots, "can you raise Vovo's tower? I think that activity might attract Dejah Thoris' attention. She and Woola must be approaching the edge of the city about now. If we hurry we can try to intercept them!" The mechano-man nodded in assent and the two of them ran together, through the trees, to the outskirts of Eo. Along the way Oman again impressed upon the Virginian the fact that Vovo's web of illusion had not been entirely destroyed by the wizard's death. Dejah Thoris was obviously still very much affected by Vovo's drugs and his mind expansion process. As for John Carter, he could be assured of Woola's arrival, Vovo's death, and other basic events he had witnessed, but Oman was adamant in saying that the Jasoomian's perception was still impaired. Only when he departed Eo would he comprehend all that had happened there. Still dazed by Vovo's drugs and mind-expanding experiment, the Princess of Helium wandered almost blindly through the city of Eo. Many of the streets were quite narrow and most of the higher buildings reached almost to her shoulders, so her movements among them were slow. The racing Earthman and metal man reached the vicinity of the late wizard's tower a couple of minutes before the giantess wandered into that quarter of Eo. "Make certain that the large window on the top floor is opened. I will signal the princess through that, once the tower reaches the level of her head." With those words John Carter sped into the metal building and awaited its elevation. True to his word, Oman caused the unique structure to rise to its full size, above every other edifice in the city. Tearing a wall handing and its rod from an interior wall, John Carter fashioned a makeshift flag and this large signal banner he carried with him to the open window. The princess proceeded with caution through the maze of buildings. Here and there she saw some of the little robots in the streets and in open windows. She forbade Woola to injure the tiny creatures and the calot did his best not to trample the things. When they came to a plaza the giantess ordered the beast to remain there. At that time Dejah Thoris saw the silver tower rise into the air above the city and she moved near the wonder to see what it was. The window in which the Earthman stood, waving his signal flag, was above her eye level, however, and the giantess missed seeing him. None of his shouting reached the enlarged girl's ears as intelligible language. Twice she uttered words to the calot, but this communication reached Captain Carter's ears only in the form of a low rumble. The single word he could distinguish in the thunderous noise was "Woola." The bronzed swordsman measured in his mind the distance from his perch to the maiden's huge head, then, gambling desperately with fate, he leaped toward the girl's raven locks. While wandering through the buildings the princess was a little amazed that she was able to identify and name practically all the architectural features. She comprehended that the structures had been built by beings much like herself and a dim recollection came to her mind that once she herself had lived in such a place. It seemed inexplicable to her, however, that an entire city had shrunk to such an extent that she could look over the tops of its many buildings without even raising her eyes. Something extraordinary must have happened -- but what? She felt something irritating near her ear and instinctively she swatted the little pest. Dejah Thoris had no way of knowing that her giant fingers could crush the man who now clung to her flowing hair. ERB Text, ERB Images John Carter® and Tarzan® are ©Edgar Rice Burroughs, Inc.- All Rights Reserved.